The roaring 20’s brings to mind images of style, sophistication, bob haircuts, flapper dresses, and intricate jewelry, most of which had milgrain style. The 1925 World’s Fair in Paris was the launching point of the Art Deco period. This period of style’s jewelry is known for contrasting colors and geometric patterns, which includes the milgrain style while maintaining a sophisticated and timeless look. Milgrain jewelry gives the wearer a look of elegance and glamour. The normal evening dress during the roaring 20s was usually accompanied several pieces of jewelry. With the lower necklines on dresses and shorter haircuts that had become popular for women at the time, it was the perfect way to show off intricate necklaces and earrings, with a beautiful and refined milgrain style, as they attended dinner parties and other social events. Milgrain jewelry has re-emerged as a timeless, beautiful, and elegant style that shows off hand-crafted works of art that just happen to be jewelry as well. Milgrain, which is also spelled millegrain or milgrain, comes from the French language meaning “thousand grains,” and it is a technique that most often appears as a borderline along the edges of rings, but this technique can be found as a texture on many jewelry types including wedding rings, necklaces, earrings, and of course engagement rings. 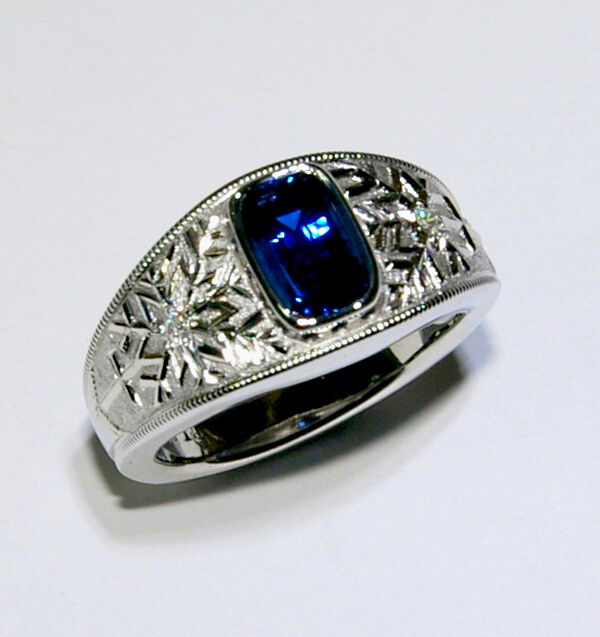 When jewelers began to use a milgrain pattern on rings, it was used to accent the flat areas of metal around the center stone, to create more depth and a more intricate design to the jewelry. The Art Deco period brought milgrain back into popular culture. This is not the first time the world has seen this technique. 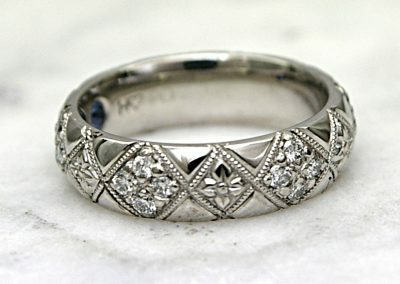 The milgrain style has been around since the first century BC, originating in southeast Asia. Originally milgrain was used in earrings but was adapted to be used in all forms of jewelry. Before modern technology, the milgrain technique was a very labor-intensive process. A craftsman would make each bead individually by hand then solder the beads one by one to the outer boundary of the jewelry. 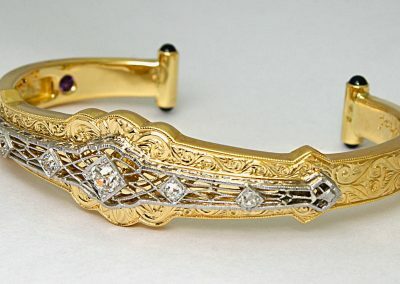 It became very popular due to the unique look and style that came from every piece being one of a kind. It gave new life to engagement rings with the intricate details like no other. Anyone receiving the engagement ring would feel it was truly made just for them. There are three different techniques that can be done to add milgrain to your ring. In modern times, the two methods we use today are knurling and ring molds. The knurling method entails using a milgrain wheel to create the texture. “What is a milgrain wheel?”, you ask. Well, it’s a wheel with smaller serrated rotating wheels that set into a handle which are rolled over the metal to achieve the milgrain style. This process then produces a tiny grain in the metal. The other modern method is to add the texture to the mold that you are going to cast the ring in. By using this method it creates the texture by having indents that the gold, silver, or any other metal that you are using form around the inside of the mold creating a milgrain pattern. The most traditional technique is the soldering method. This method is the method that made the milgrain style so popular. This entails an extremely detail-oriented process of attaching each individual, handmade bead to the frame of the piece one by one. All three ways of doing the milgrain technique will leave any engagement ring standing out among the rest. 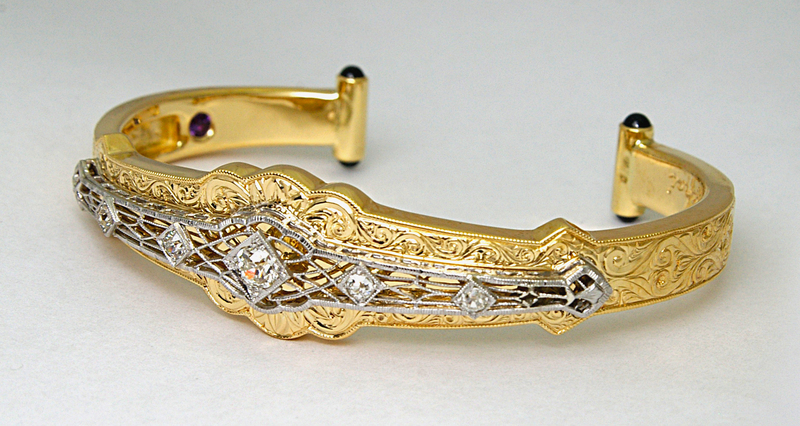 Whether it is in an antique piece of jewelry or your own jewelry, you can find the milgrain pattern in many places. In today’s market, milgrain adds a vintage look to any engagement or wedding ring. 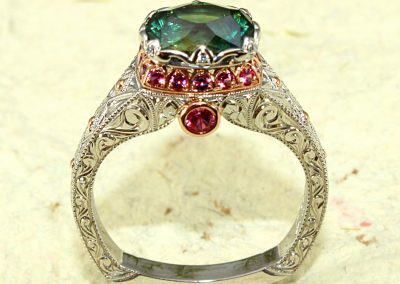 Not only does it add that vintage or antique look, the style itself adds so much detail to a ring it will have anyone dropping their jaw when they look at it. The detail around the outer frame of the ring helps draw the eye to the centerpiece of any engagement ring, the diamond. The beauty of the milgrain style is it can be used in many ways. 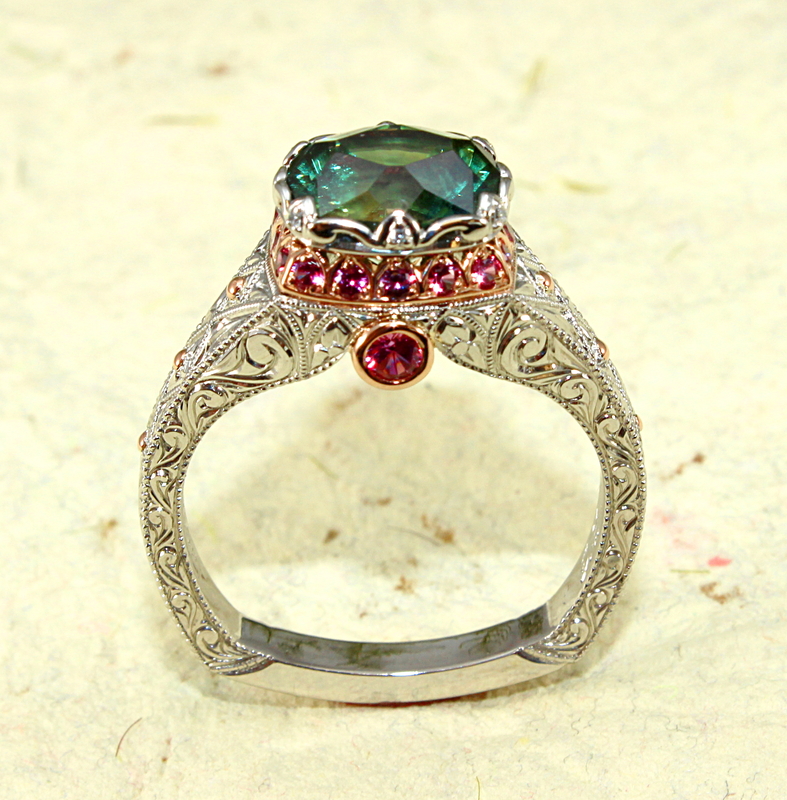 It can be used for framing, etching, and even highlighting important parts of the ring. The texture of milgrain helps draw the eyes to the many details within the design of the ring, which is important when you are designing any type of jewelry. With the milgrain pattern, you can also add a wide variety of styles. You can add a smaller milgrain pattern just to be an additional detail to the ring or make the milgrain pattern larger and more noticeable to become a design all on its own. You can do so much with milgrain to make any engagement ring really unique. With the uprising popularity of the milgrain engagement ring style, it is important to know what you want out of your ring. With the detailed-oriented craftsmanship and design, milgrain won’t just make your engagement ring or piece of jewelry stand out among the rest, it will also give the piece its own life. Making the recipient of the piece really feel like it was made just for them. 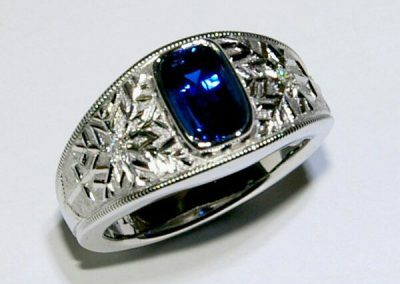 Classic styles of jewelry have been becoming increasing popular. By adding a milgrain styling to your ring, you can add a classic look on a modern ring.